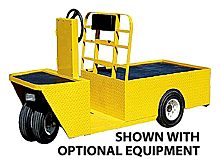 Built for reliable service, low cost of ownership and safety, this burden carrier vehicle for one person standing has a large rear deck (35.5-in. x 48-in.) for carrying significant loads. A smaller front deck carries smaller items easily. Dual front wheels take loads in stride as the vehicle cruises up to 11 mph. on a 220 amp hour battery. Able to carry a hefty 1,000 lb. load or pull up to 2,000 lbs. at a time, this vehicle has a 36 volt battery with a 7.5 hp. output for plenty of power to carry the loads you need moved. 3-year manufacturer warranty and satisfaction guarantee. Deck Size: 35.5" x 18"